Designed by Dana Brooks for Henry Glass & Co. This cotton print panel measures approximately 44" x 36". 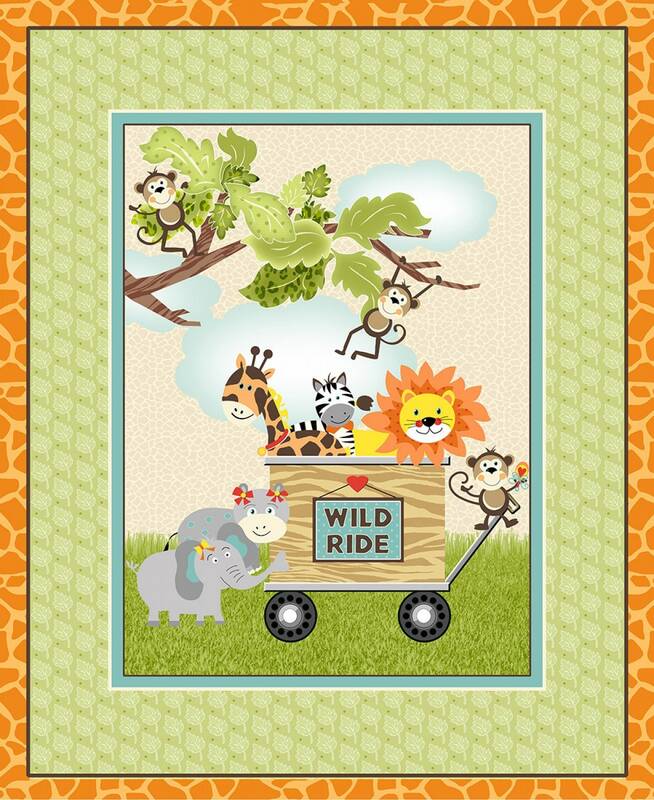 Fun jungle animals riding in a wagon going for a wild ride. A wonderful addition to any baby nursery. Add our fun coordinating print to complete this wonderfully sweet quilt panel. Colors include shades of orange, green, shades of jade, yellow, brown, shades of grey, black, and white. All fabric from The Quilted Nursery Children's Fabric Store is cut directly from the bolt in continuous yardage. We now offer fractional yardage cuts for your shopping convenience. All shipping overages are refunded on shipment of fabric. All orders ship same day except for Sunday and holidays! So soft and cute. Will enjoy quilting this for a friends baby. Great buy and super fast shipping.